You may think there is only one way you can design loft stairs, but you would be wrong. Your loft staircase will normally be the first piece of work that is completed on your loft conversion and will act as the gateway up to your loft, so it is important you get it right. It’s not only important that your loft staircase looks good, but if you don’t make your loft staircase permanent then a valuer may not count it as an extra room in the house, so you may not benefit from the added value that the loft conversion will bring to your property. The loft stairs will give people the first insight into your loft conversion so it is important not to skimp on the design of the stairs. An architect will normally draw up the plans for the loft staircase and you can work on the design together. The initial design will not be set in stone though and you will be able to switch it around as the project moves on. Most lofts will be fitted on site, which will allow the builders to negotiate around tight corners and awkward spots. When designing your loft staircase you will need a check-list of things that you will need to think about such as the handrail, the height of the steps, the under-stair design, and what kind of banister you want. 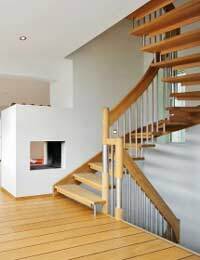 You will also need to consider what lighting you will want on your stairs and whether this will coordinate with the main lighting in the loft conversion. You will need to make sure you put light switches at both the top and bottom of the loft staircase. If you’re not a fan of the dark you might also want to consider where you are going to put your window in relation to the stairs, as this could provide more natural light and open up your loft stairs. Think about what you are converting your loft into before you start work on your loft staircase. If your attic conversion is to be used as a playroom, then you may want to install a banister that will separate children from the stairs, to stop any accidents. If the room is not going to be popular with the neighbours and used as a music room then you may want to put in an extra door at either the top or the bottom of the stairs so it will help block out any unwanted sound. The same applies if you are trying to create a tranquil room to escape to, it’s a good idea to install extra doors around the loft stairs to help block out any sound you don’t want coming in. Your first step should be to call in an architect and get some proper plans drawn up for what you want your loft stairs to look like. You will then need to strip back any existing carpet on the stairs and make them as clean as possible so it’s easier when you start work. Depending on how adventurous you are feeling you can either create the timber frame for the staircase or you can get the loft specialist to do this. Before the stairs are completed you will need to first sort out your electrics and plumbing in case you need to fit any wires and pipes underneath the stairs. Your loft builder will then be called in to fit the stairs and build them to your specified plans. The last job they will do is to fit the handrails and plaster the walls next to the stairs. The next job is the fun part of painting and carpeting your loft stairs and then sitting back to enjoy them. Loft stairs are part of your loft conversion that you cannot scrimp on, they give the lofts first impression so it is important you seek professional advice and follow the building regulations, after all, if you don't get your stairs right you may find you can't get to your new loft conversion. Hi, I am looking for a builder who can build loft stairs. Are there any builders available in your company? We have a loft extension with staircase up from first floor.There is a cold draught which comes down from the airy space around this staircase,We are considering getting the stairs boxed in and having a glass door put in at the base of the loft stairs in an attempt to improve warmth of house.Is this cold air a normal issue? If your loft/roof has been effectively insulated this should not be an issue, so it might be worth checking that out first. There are many highly effective modern materials that can be used - usually an insulation material is followed by insulated plaster boarding on loft conversions/roof extensions. We have a loft extension with staircase up from first floor. There is a cold draught which comes down from the airy space around this staircase, We are considering getting the stairs boxed in and having a glass door put in at the base of the loft stairs in an attempt to improve warmth of house. Is this cold air a normal issue? I need staircase built to my loft conversion? I have a three bed house!I plan to have a open staircase so you can see through the steppingstone?A quote would be good? We don't actually do loft conversions, this website is for advice only. Ask around your local area for companies that do this, then get several quotations. I need staircase built to my loft conversion? I have a three bed house! I plan to have a open staircase so you can see through the steppingstone? A quote would be good? Actually, the main thing to consider is room. You'll be going up off the landing, and in most cases there might be difficulty having a permanent fitted staircase up to the loft, unless you have a very good architect. For many of us, the traditional pull down steps are the answer, as they can vanish out of sight back into the attic to making moving around much easier. Do think about this before committing to a conversion.